Laminate flooring is a multi-layer synthetic flooring product fused together. Laminate flooring simulates wood with a photographic layer under a clear protective layer. Laminate flooring has grown significantly in popularity, perhaps because it may be easier to install and maintain than more traditional surfaces. 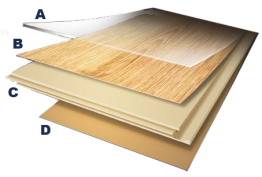 It may also have the advantages of costing less and requiring less skill to install than alternative flooring materials.It’s an amazing manufacturing process by which four layers are fused together in a single press operation at high heat at over 300˚F using direct-pressure laminate construction.